Anywhere that you spend your time - detect the electrosmog ’hotspots’ in your environment and protect your family - if you hear anything in a bedroom, do something about it. To get 10% off your purchase price please add Quantum SCIO, in the discount code box under Additional Information, at check out. Click here to visit Sensory Perspective Ltd. to purchase items. The beneficial effects of Chi (energy) stimulating exercise are now within the reach of every household with the Zen Chi Aerobic Massager. All it takes is fifteen minutes morning and night to gain the recommended thirty minutes of daily exercise! The Zen Chi produces a motion through the recumbent body, similar to a swimming fish, which relieves compression from between the vertebrae and alleviates stress and tension on the spinal column. 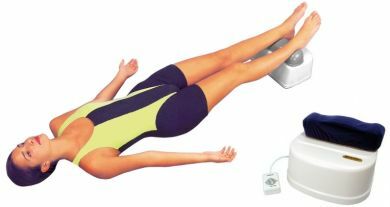 Elevating the feet is also a proven technique for relieving the symptoms of painful ailments such as fluid retention, poor circulation, varicose veins The unique wave-like motion replicates an exercise movement and promotes the flow of blood to capillary banks in all extremities of the body, restoring supply to areas that may have suffered poor circulation. Body detoxification may be improved via enhanced lymphatic circulation and abdominal peristalsis, which is the movement of the involuntary digestive tract muscles. electroDOTs are a range of bio-resonant harmonising discs, designed to retune environmental electro-pollution with health promoting harmonics. A family of small magnetic ‘DOTs’ for all lifestyle electro-pollution situations, each DOT is activated with Programmed Harmonic Interface (Phi) Technology’s powerful resonant signature to naturally restore essential integrity and flow in EMFs and bio-fields. Successfully applying the principal that the heart of well-being is the harmonious flow of vital energy. PhiTechnologies have been used by health professionals around the world for over ten years as a positive choice for well-being in the wi-fi world. Relief from from Electro-Stress. Mobile Phone. Computer. TV. Etc. Electodots are £25 for each one. Personal Energy optimiser, for vitality and wellbeing. Wi-Fi harmoniser, for Radio frequency Integration. For all transmitting devices –base stations, wifi routers etc. Apply an electroDOT to your mobile phone, computer or other electronic equipment. 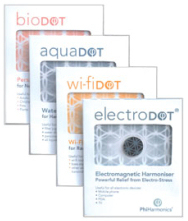 Attach a wi-fiDOT to your broadband router, an aquaDOT to your water filter and customise your favourite jewellery with a bioDOT.